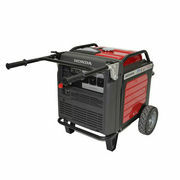 The all new Honda EU70is Generator is being introduced with an advanced electronic fuel injection system! In return producing greater fuel efficiency keeping the running costs to an all time low. As a matter of fact the EU70is will run for up to 18 hours on a single tank of fuel! The technology in Honda's EU70is features a sine-wave inverter which outlays high quality power! As a matter of fact the power is commercial quality meaning it can run sensitive equipment such as computers and electronic devices. 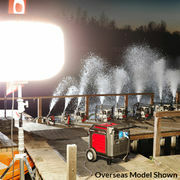 One of Honda's EU20is generators greatest features is its quiet operation. The innovative separate triple chamber construction produces low noise operation of only 52dB(A) knocking its competitor models out of the park! 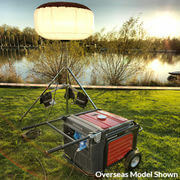 While still producing a max output of 7000W/240 volt AC. The operation of the Honda EU70is generator is made easy due to Hondas 'i-Monitor' display screen supplying you with all the diagnostics of your generator before your eyes. The low oil alert system, easy maintenance, and 4 stroke technology makes running a Honda EU70is a walk in the park. And transportation is simple with the parable wheels and the 'H' shaped fold down handle. Honda's start first time every time and the EU70is is no exception with the easy electric push button start (backup recoil start) taking reliability to a whole new level. 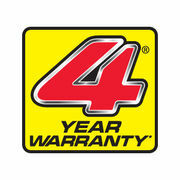 As per usual Honda offer a huge 4 year domestic warranty and 12 month commercial warranty giving you the piece of mind that you are buying a product that Honda backs in for the long haul. And so should you! This enables the EU70is generator to only run as hard as it needs to. Resulting in less noise and a more fuel efficient machine that will last longer than its competitors as they will not over work. All you need is a can of straight unleaded fuel removing that annoying need to mix fuel. Super quiet generator running at low noise operation it is only 52dB(A)! This is due to Honda's separate triple chamber construction. Honda Offers a very generous 4 year domestic warranty and 12 month commercial warranty, and with 400+ dealers Australia wide you will always have someone close to you! The top quality Honda inverter produces clean, commercial quality electricity making it perfect for running extra sensitive electrical equipment such as computers. Your Honda EU20i will never be damaged as a result of not having enough oil. The handy Oil Alert system automatically shuts the machine down if the oil falls below the desired amount.